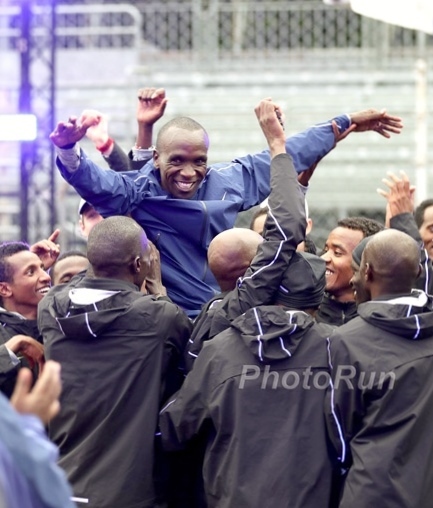 The fall marathon season began in Berlin with an impressive achievement of reigning champion Patrick Makau. 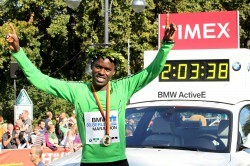 The 26-year-old Kenyan improved the world record with his win at the 38th BMW Berlin Marathon. He crossed the finish line near the Brandenburg Gate in 2 hours 3 minutes and 38 seconds. A dramatic surge in pace near the 27-kilometer mark sealed Patrick’s victory over Haile Gebrselassie who had to drop out at 36K. 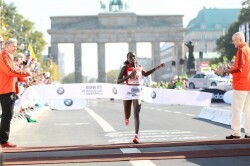 It is the eighth marathon world record that has been set in Berlin since 1977. “This has been the greatest day of my running life,” said Patrick Makau. “I feel very proud. At 25 kilometers I felt I could break the world record.” He ran 21 seconds faster than Haile did three years ago in Berlin—and also improved another of the Ethiopian superstar’s world records when he reached 30K in 1:27:38. At the 2009 edition of the Berlin Marathon, Haile’s time for the distance was 1:27:49. Split times are recognized for world-record purposes if officials of the International Association of Athletics Federation (IAAF) are positioned to record them, which was the case in Berlin. Finishing a surprising second behind Patrick Makau was Stephen Chemlany who was invited to the race as a pacemaker—but did not drop out! The relatively unknown Kenyan runner finished in 2:07:55, ahead of his compatriot Edwin Kimaiyo (2:09:50). Felix Limo of Kenya took fourth place (2:10:38) and another complete surprise in fifth was Britain’s Scott Overall who ran 2:10:55 on his debut—in the process securing a coveted Olympic qualifying time for London 2012. The women’s race was almost as outstanding, with Florence Kiplagat recording the second-fastest time in the world this year with her victory in 2:19:44. 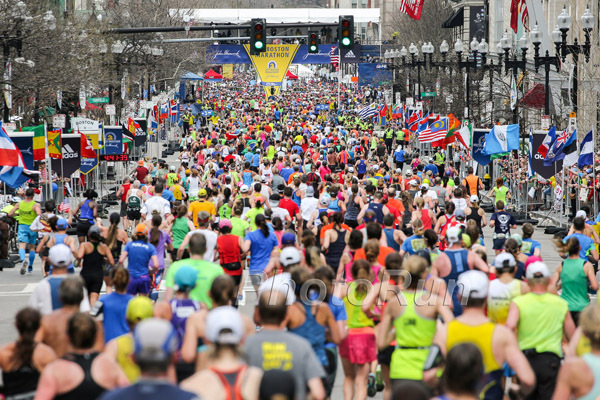 It was a day of joy for the 24-year-old Kenyan, who was forced to drop out at the 30K mark in Boston in April. Irina Mikitenko ran a fantastic race as well, clocking 2:22:18, which was good for second overall and the third-fastest time of her career. It was also her best marathon in the past two and a half years. World-record holder Paula Radcliffe of Great Britain was third in 2:23:46—perhaps satisfying for her, because she hadn’t competed over 26.2 miles in nearly two years after taking a break to have her second child. Other runners finishing under 2:26 were Atsede Habtamu (Ethiopia/2:24:25), Tatyana Petrova (Russia/2:25:01), and Anna Incerti (Italy/2:25:32). Nearly 41,000 enthusiasts from 125 nations registered for this 38th edition of the BMW Berlin Marathon, the first of the fall’s World Marathon Majors race series, with 33,157 participants finishing the race. 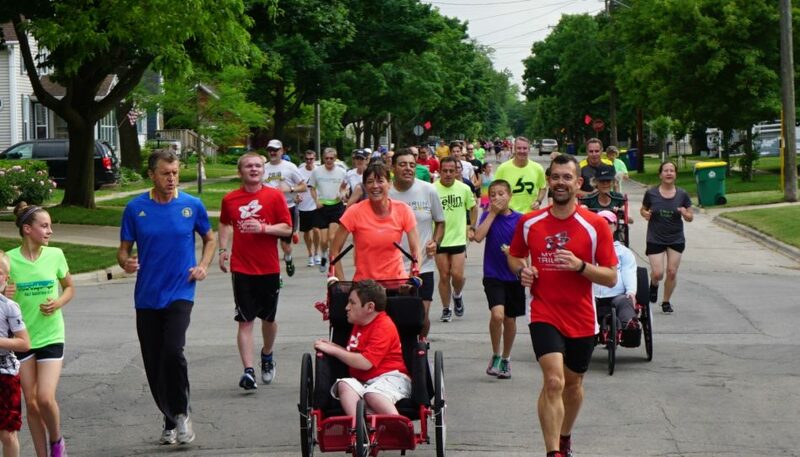 They included not just runners, but also wheelchair athletes, hand cyclists, and power walkers and they were cheered on by almost one million spectators and inspired by the music of more than 70 bands along the course. The Berlin Marathon not only offers participants the chance to achieve a fast time, but also to explore the city and its historic sites on the run. The route follows world famous landmarks such as the Victory Column, the Reichstag, the Kaiser-Wilhelm Memorial Church, and the Potsdamer Platz. During the last 400 meters, the course winds through the historic Brandenburg Gate. From the start of the men’s race, the pace was incredibly fast, with the leaders clocking impressive opening miles amidst near-perfect conditions: 55 to 61 degrees Fahrenheit in the shade, sunshine and barely a breath of wind. The pace and split times closely matched Haile Gebrselassie’s world record. Six pacemakers led another five runners to the half-marathon mark in 61:43 minutes—17 seconds faster than planned. The next 6K proved to be dramatic and decisive. After four pacemakers dropped out, Kenya’s Edwin Kimaiyo, Emmanuel Samal, and John Kyui fell back. The sudden loss of nine members of the lead group set the scene for the much-anticipated duel between Haile Gebrselassie and Patrick Makau. But the race between the two favorites was decided faster than anyone expected. At 27K, Patrick suddenly sprinted away, leaving the world-record holder behind as if it were the bell lap of a track race. Shortly afterwards, citing breathing difficulties, Haile came to a halt. He recovered to run another 8K, but ultimately had to drop out of the race. His manager, Jos Hermens, indicated that the legendary athlete, who had won the Berlin Marathon four times in the past few years, might now run the Dubai Marathon. Patrick Makau told reporters that his day did not start as gloriously as it finished. “When I woke up, my body didn’t feel very good,” he said. “But as the race went on, I felt better.” Thanks to his amazing race, he is now likely to be pre-selected for his country’s marathon squad in next year’s Olympics. “I came to Berlin to win. It is, of course, a great test to run against Haile. But I expected to have a tougher race from him.” You can read more about Patrick Makau in this interview (posted after his 2010 Berlin Marathon victory) here on our Website. In the women’s race, Florence Kiplagat and Paula Radcliffe took off from the start, with their early pace pointing to a 2:20 finish time. But shortly after 15K, the pace proved too fast for Paula’s comeback race. She slowed to save her strength, while Florence was able to maintain her pace, crossing the line in 2:19:44. “I didn’t expect to run this kind of time,” said last year’s world half-marathon champion, who is married to Moses Mosop. 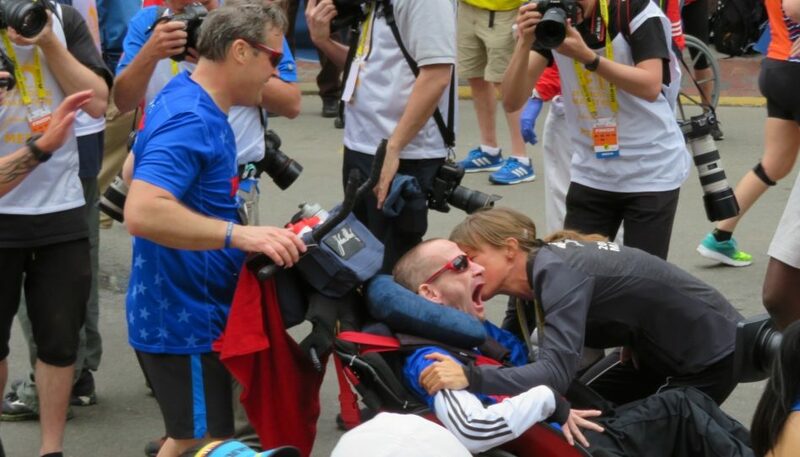 He placed second at this year’s Boston Marathon in 2:03:06. The contest for a podium finish behind Florence Kiplagat was full of dramatic turns. 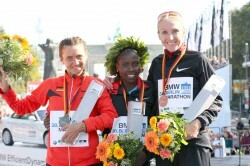 For much of the race, Irina Mikitenko and Atsede Habtamu, the winner in Berlin two years ago, were at least a minute behind Paula Radcliffe. But shortly before 35K, both passed the British runner. After that, Irina Mikitenko was able to break away from the Ethiopian contender. Paula came back to pull ahead of Atsede Habtamu and finish third. 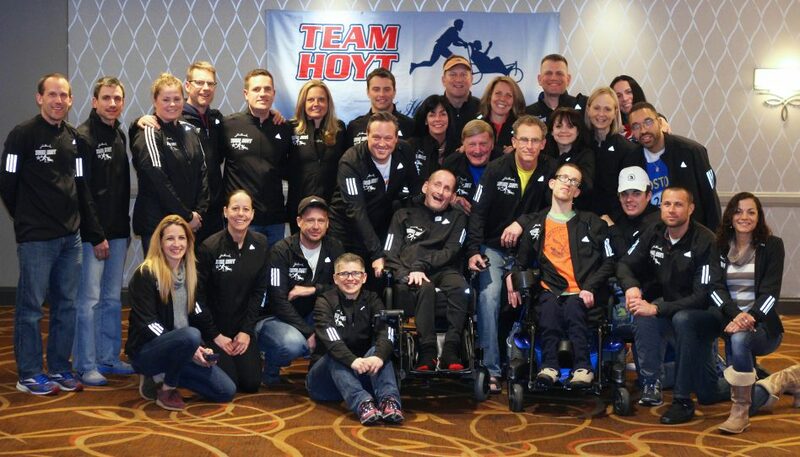 Hundreds of charity runners representing the RTL-Telethon—a fundraiser, which the German television network RTL broadcasts each November—also took to the streets. With the motto “Wir helfen Kindern” (“We help children.”) their aim was to raise 42,195 Euro (approximately 56,676 US-Dollar) this year with all proceeds benefiting various children’s aid projects in Germany.